There are a number of things that could affect the final cost of a sprinkler system installation such as location, size, property types, manual vs automated and many more. According to “RedBeacon”, a company that connects professionals with homeowners, sprinkler systems tend to range between $248 and $1288. Below are some of the important factors that will affect the final price for a sprinkler system installation. Location and size are going to be the biggest factors when it comes to the final cost of a sprinkler system. Large areas that require more sprinkler heads and pipes are going to be pricier, while small lawns will see a much less expensive installation bill. Sprinkler systems run in zones. Zones are areas made up of pipes that usually have 5 to 10 sprinkler heads. 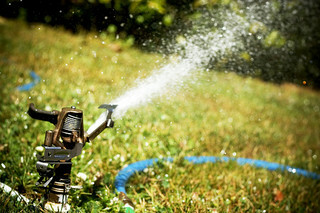 Due to Zoning, the price of a sprinkler system will not go up proportionally to the size of your lawn. In other words, a property that is twice the size does not equate to twice the price. If you are on a tight budget, we suggest putting in the system and plumbing first and adding zones along the way. This is because installing an entire new system is more expensive than adding zones. According to RedBeacon, The national average price for installing a sprinkler system varies depending on the property type. 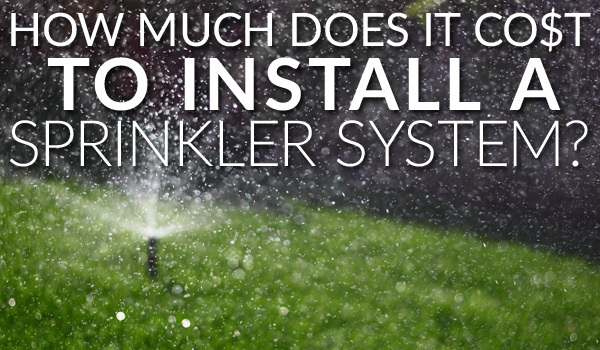 Depending on the complexity of the sprinkler system, exposed yard installations cost anywhere between $946 and $1182. Since trenches and holes must be dug out to place the lines, heads, and valves, installing a sprinkler system in a bare yard where there is little to no landscaping is ideal. Existing Lawn: The average price varies from $1008 to $1354, but additional fees most likely will apply to restore the sod and plants. Even though existing lawns probably already have a sprinkler system, it generally requires more effort to install a sprinkler system. It is more work because they must remove the sod before starting. This usually requires extra tools and workers to complete the job. 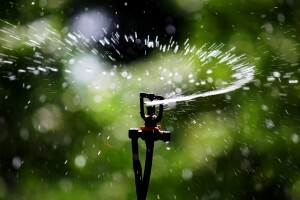 There is a variety of uses for sprinkler heads, but knowing how to distribute the water will save you money. Different system designs will also affect the final cost of the installation. Manual systems do not have any electronic parts and are turned off and on through the operation of valves. This system is cost effective to install, but many people tend to over water when using a manual system. Automated systems use controls that electronically turn the system on and off. These systems run off an automatic timer which needs a power supply and programming to receive the best cost and application. Automated systems are usually more expensive than manual systems, but the cost includes both parts and installation. Automated systems also have custom controls and automatic shutdowns that are very effective and efficient. This will most likely save you money in the long run. This is a very important factor! You may think you’re getting the better deal by going with the cheapest way but, in the long run, you could end up paying way more. The saying is true quality over quantity! You need to make sure that you are receiving quality pipes, sprinkler heads, and a timing system. Using your water efficiently will save you money! Setting your system for a particular time of day and duration will keep costs down. The best time to operate a sprinkler system is early mornings and/or late night. Plan, plan, plan!!! This will save you the most money. Knowing how complex your system needs to be and for what purpose it will serve allows you to better plan for the installation cost. Also, keep in mind the landscape of your yard and the accessibility to plumbing and electrical connections. If this sounds a little overwhelming for you no worries! At AZ Sprinkler, we help you with every detail! If you have any questions please feel free to call us at 1-800-420-6010. Next Next post: What is the Best Irrigation System for Arizona Soil?